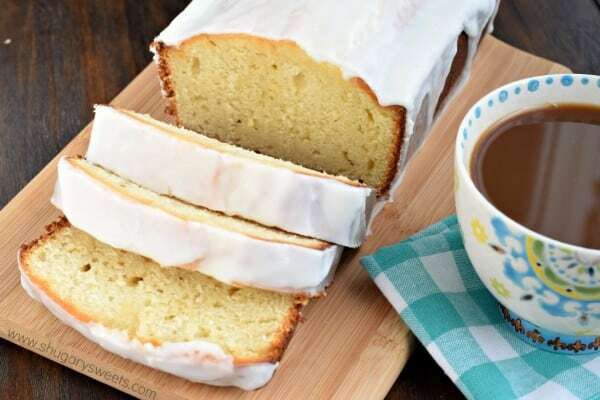 This Copycat Starbucks Lemon Loaf is even better than the real thing. Why? Because you can eat a whole loaf without having to explain it to the person behind the counter! Ha! There are some things in my life that only the name brand will do, and no amount of copycats or generics can be acceptable. Cream Cheese. I’m sorry, but if I’m baking with cream cheese, it’s got to be Philadelphia. The texture and flavor is perfect. Doritos. Don’t even try to pass those crappy, sad, no name cheese tortilla chips my way. They don’t taste the same. I don’t care how much money they saved you. Peanut Butter. It’s Jif or Smuckers only in our house. DEFINITELY not some off name store brand. Sorry. Ketchup. I’m a Heinz fan. No other ketchup can stand the test in our home. Too watery, too bland. It’s got to be Heinz. I’m sure there are more, but those are the ones that come to mind immediately. We’re like Goldilocks in this house, it’s got to be JUST RIGHT. Know what I’m totally cool with? Recreating coffee house drinks and desserts. Why not make a copycat of those when you can? Because let’s be real, paying $8 for a cup of coffee and slice of lemon bread just isn’t realistic for me to do on a daily basis. 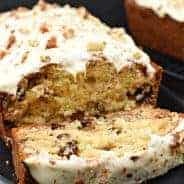 Why not make this recipe, which makes TWO loaves of lemon bread? And you can freeze them and save for later! Whenever I’m at the airport, a Starbucks cup of coffee and slice of Lemon Loaf is my go-to “bring on the plane” treat. But the last time I flew, there was NO Lemon loaf. I was sad. And disappointed. And had to take a plain bagel instead. Which is NOTHING like a slice of sweet Lemon Loaf. NOTHING. In looking up various “copycat” recipes, many of the ones I found call for using a box of cake mix and a package of lemon pudding. Um, no thanks. So naturally, I looked in my own archives for a recipe that I can adapt and use as a base. 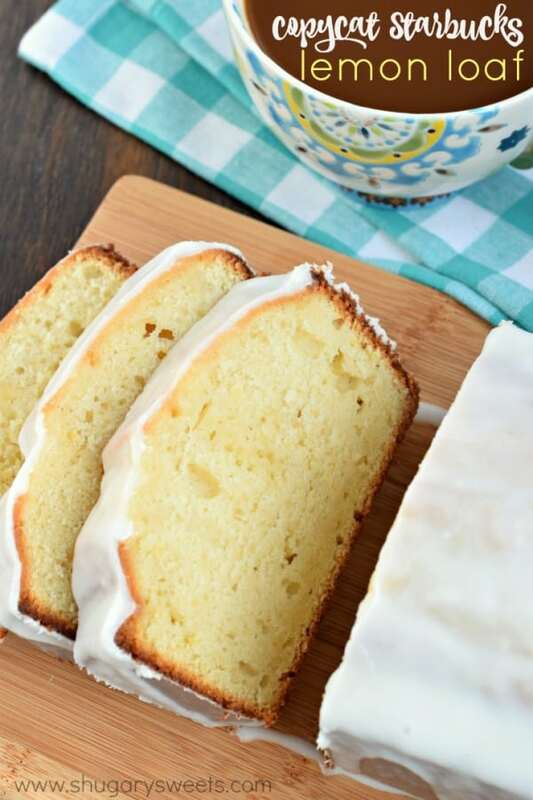 It turns out this Lemon Loaf was pretty close to my favorite Starbucks treat, I had no idea! I changed it up slightly, and adapted the recipe so it would make TWO loaves of bread. If I’m going to bake something from scratch, I like to be able to freeze extra. It’s like cooking once and getting two meals. I’m all for that. I hope you love this bread as much as my family did. Because the second loaf of bread never even made it to the freezer. The first loaf was gone on day one…and the second one was gone two days later. The sugar syrup on the bread adds extra moisture, keeping this bread fresh and moist for days longer than traditional sweet breads. ENJOY!! 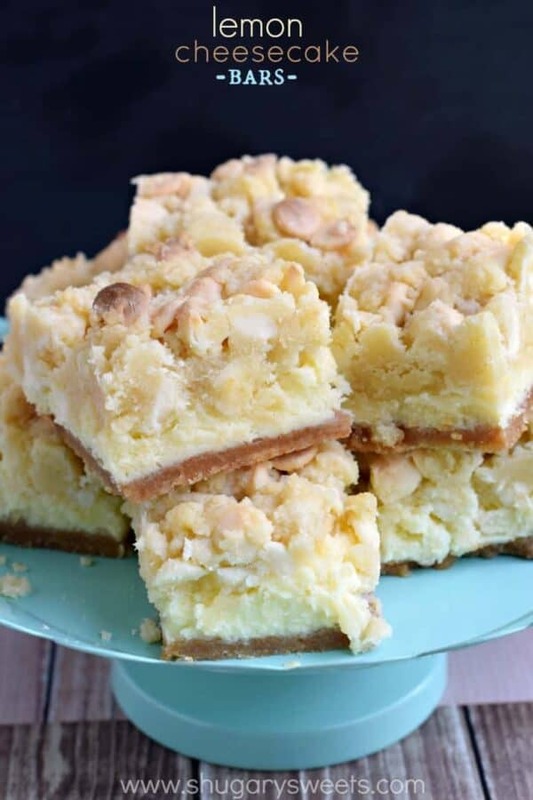 Lemon Cheesecake Bars: delicious layered bars that will WOW your taste buds! 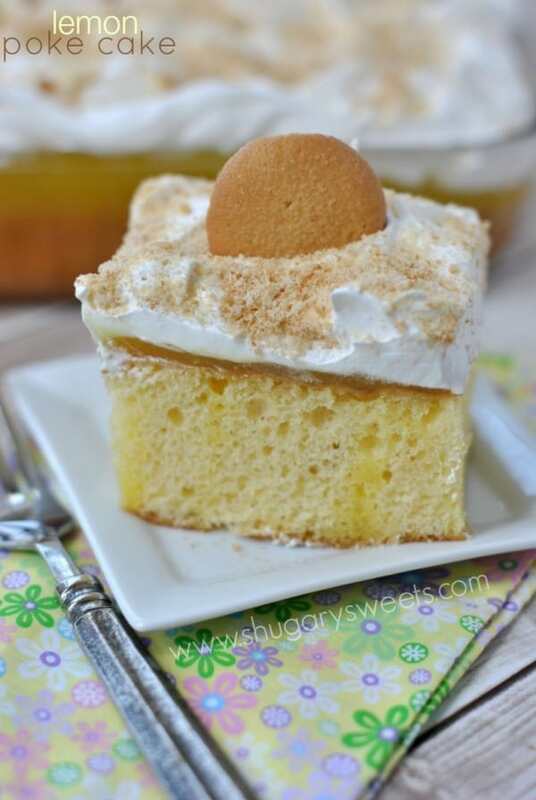 Lemon Poke Cake: a refreshing, EASY, cake recipe! 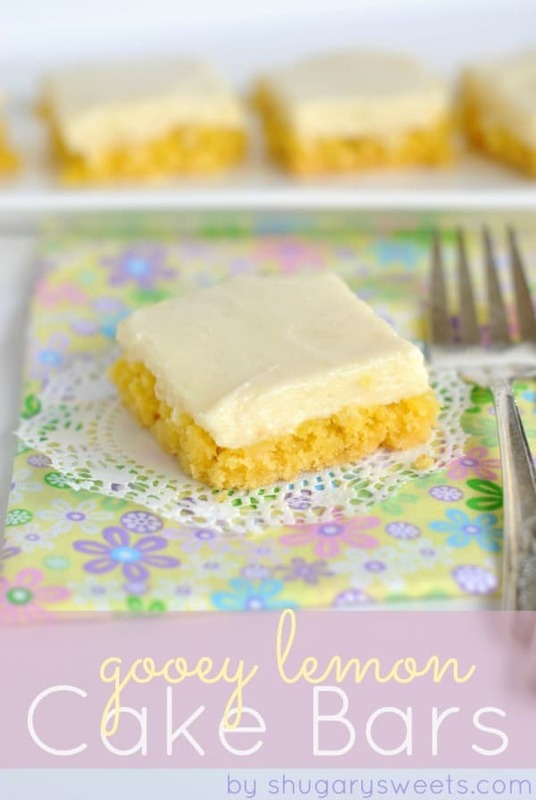 Gooey Lemon Cake Bars: I love these gooey bars, you won’t believe me when I tell you that is NOT frosting on top! 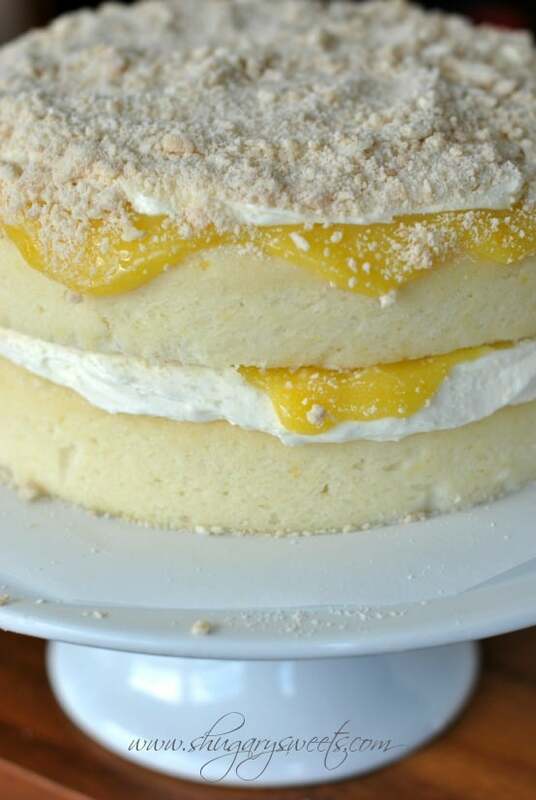 Lemon Cake: this “naked” layered lemon cake is always a hit. Use homemade lemon curd too! In a large mixing bowl beat butter with sugar until fluffy (about 2 minutes). Add eggs, one at a time, beating until fully incorporated. Beat in lemon zest, 1/4 cup of lemon juice, and vanilla extract. For the glaze, whisk together the sugar, lemon juice and heavy cream. Add more or less cream to get desired consistency. Pour over cooled bread. Allow to set (about 15 minutes). Slice and enjoy. Store in airtight container for up to 5 days. ENJOY! My husband will not let any TP in the house that isn’t Charmin. He even sings the theme song. And back when our kids were in diapers, I couldn’t do any other brand but Pampers. I think the other ones leaked, and it’s worth spending any amount of money to avoid that. Plus, I mean, Reese’s. That’s brand loyalty. I do not truck with generic PB cups of any kind. And the lemon loaf. How could they be out of it?! That is just a major blow. I’m glad you were able to bake this and get it out of your system! Haha – I couldn’t help chuckling at your intro because that’s my kinda thinking! 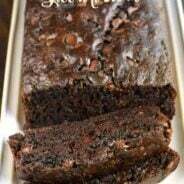 🙂 And freezing the second loaf instead of gifting it is also my kinda thinking – so bad but so good eh?! I adore the texture of this loaf – and the fact that it’s homemade makes it BETTER than the Starbucks loaf! So true about some brands being better than generic, I couldn’t agree more about the cream cheese. Sign me up for an extra large slice of this lemon loaf, it looks so good! 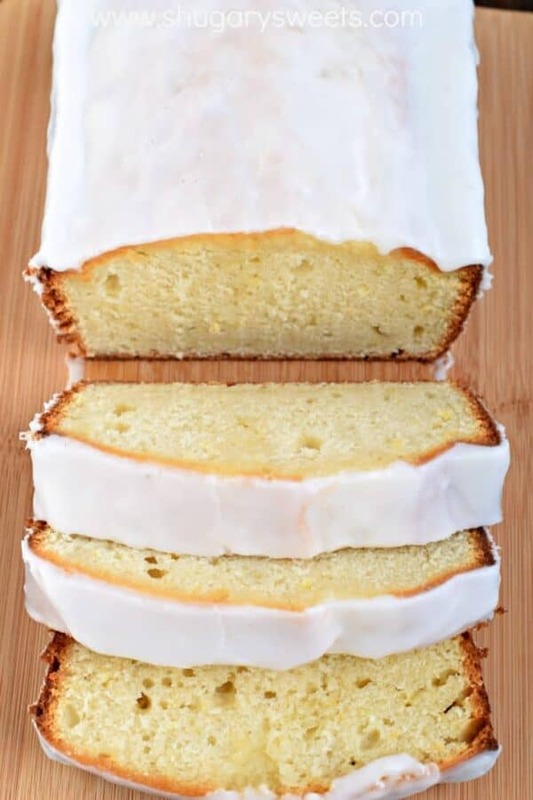 This lemon loaf cake looks picture perfect. Love all that lemon flavor! The texture looks spot on! Wish I had a slice to go with a big mug of coffee right now! Glad you were able to recreate it and get it just right! Oh heck no to the fake Doritos!!! I have a tree full of lemons in my backyard and this cake is calling my name. I’m ready for a piece (or two) right now! Ha! I’m the same way about peanut butter…but not your brand. I like the OTHER ONE. I’m also partial to name brand coffee. NO substitutes! 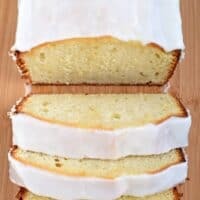 But copycat lemon loaf? I’m all over this! I so adore any lemon quick bread and this one makes me want to lick my computer monitor. But of course then I’d wipe it ONLY with a Bounty paper towel. I respect a girl’s boundaries. AAH!! My printer is telling me my ink is low, am on my last 10or so pieces of paper in the thing, but, HAD to do it!! Print, pin, ALL the lemon yummies! Thanks. No really. nice to see refreshing recipes! Darn healthy chia,quionia,grits,whatever!UGH!Hope not to offend anyone, but when I see those seeds in food, they GROSS me out! I try, really I do. Quinoa, I just do not like the texture. On the other hand, save me some jingolla by making a Starbucks copycat, a lemon recipe no less? Throw in a few more lemon recipes?! All good here! I LOVE lemon everything. Seriously. I could make this a lemon blog and be happy forever 🙂 I don’t mind chia seeds (I use them in place of poppy seeds often). But you won’t be seeing a quinoa recipe here for awhile. I don’t care for the texture either (although I did have a friend make some peanut butter quinoa bars that were pretty tasty). Exactly! Your five are in my top 10! This is going to be wonderful to make. It is like a bite of spring! Thanks for all of your wonderful ideas, recipes and thoughts! Glad I’m not alone in my brand loyalty 🙂 Have a great week! These pictures have me drooling. The salad I am eating right now just isn’t cutting it. Usually I am a chocolategirl all the way, except when it comes to lemon. Trying this ASAP! I just had a slice of Starbucks lemon loaf yesterday – it’s my favorite Starbucks treat. I agree with you, spending $8 on a coffee beverage and a slice of lemon loaf isn’t something I can afford to do every day! As advertised! Absolutely delicious, I agree, better than Starbucks even. I didn’t have 2 loaf pans so I baked entire recipe in a bundt pan and it turned out great. Thank you for this recipe! I made your copycat lemon loaf for work… it was a hit!!! Thank you!!! Aimee I have two questions could you do these in mini loaf pans? I am trying to help my grand daughter raise money for her softball team uniforms. Also can you use sour cream in place of yogurt? So glad I will have extra for myself to have with my Brand name coffee lol loved your post. Thanks for the laugh. 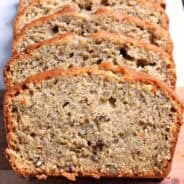 After just laughing at a question on my favorite Banana Bread recipe where someone asked if they could make it without bananas I know I shouldn’t have laughed but, it just made me giggle. When it a calls for flour can you substitute it with self rising flour, instead of plain? Do you have a recipe for Chewy Blondie Brownies,,,nothing added just the blondies?? and chewie cookies?? Do you freeze it with the icing already on it? Yum! This looks just like the real deal! Can’t wait to make it! I love this! Now I can have an entire loaf to myself! This is the stuff dreams are made of! I love anything lemon and this recipe doesn’t disappoint! You have made my day! This is my favorite treat from starbucks besides the coffee. This loaf is my son’s favorite from Starbucks! Thanks for the recipe so I can start saving tons of moolah! I’ve never actually tried the lemon loaf at Starbucks, but your version has me drooling. I love all things lemon and can’t wait to try it! We LOVE the lemon loaf at Starbucks!!! This is SO good! Thank you for sharing, it’s amazing! This looks so simple and delicious. Can’t wait to try it.